When summer comes to an end, it’s a good time to pack away the pool noodles and beach umbrellas and locate where you stored your jackets, scarves and sweaters in advance of autumn weather. But as the last weekend of the summer buying season, it’s also a good time to find great deals on the products you want and need thanks to Labor Day sales nationwide. What's on Sale for Labor Day? You may already know that this is the optimal period to pick up deep discounts on warm-weather items like grills, pool equipment and bathing suits because stores are trying to clear them away. But you may not realize that it’s also a period when you can get big-ticket items like cars, mattresses and even electronics at a deep discount. Because Labor Day this year falls on Sept. 3, you’ll start seeing deals and sales go into effect by Aug. 31 (the Friday before) or perhaps even sooner. Here's how to find the best Labor Day deals both in stores and online. Summer Items. Nearly every store will have summer items on clearance by the time Labor Day rolls around since they need to clear the sales floor to make way for things like coats, sweaters and even artificial Christmas trees. For things like grills, check out Lowe’s, Ace Hardware or Home Depot, whereas if you’re looking for items that you’d take to the beach or pool, head over to big box stores such as Target or Walmart. Most clothing stores will have bathing suits, shorts and summer dresses on deep discount, and you can score footwear like sandals and water shoes for less at most shoe stores. Mattresses. 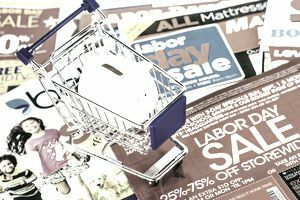 Although mattresses don’t seem to be seasonal items, you can typically find prices slashed for these products during the Labor Day holiday. Traditional mattress retailers like US-Mattress and Mattress Firm are sure to have deals, but you can typically also find low prices on mattresses during Labor Day at department stores like Sears and via online retailers such as Overstock. Keep in mind that if you’re buying a mattress online, you should always check the reviews listed on the internet since you won’t be able to “test out” the mattress by lying on it. Electronics. Football season is approaching, which means many fans will be looking for ways to display the big game on their living room walls. Labor Day is a great time to find deals on TVs and other electronics. Brick-and-mortar retailers like Best Buy and Office Depot usually have great discounts on everything from computers to phones and beyond. In addition, you’ll be able to find excellent deals from online electronics shops such as NewEgg as well, which often offers discounts on these products around the Labor Day holiday. Cars. Believe it or not, many car dealerships are scrambling to unload their current model year cars already, even though the New Year is still months away. This can translate into amazing deals and discounts on both new and used cars during the Labor Day weekend. You can either visit the website or in-store showroom of a major car lot like CarMax or an individual local dealership near you, depending on which make and model of car you’re seeking. The higher number of current-year cars a particular dealership has on the lot, the better the deals will be, so you may have to do some emailing and calling to see what kind of inventory the dealerships have and what types of Labor Day discounts they are offering. Almost everything listed above can be found on discount at Amazon over the Labor Day holiday. If you’re back-to-school or dorm room shopping, you’ll find everything from notebooks to desks on sale, but you can also get great deals on things like grills, mattresses, clothes and electronics on the site during the three-day weekend. In previous years, Amazon has even featured Labor Day deals like Prime discounts and half-priced e-readers. Amazon maintains a special site for its Labor Day discounts. The site for Labor Day goes live months before the holiday starts so you can get a sneak peek at the upcoming offers.